Lower playfield GI keeps going out on FT and manually pushing on J115 causes it to come back on then off again. I redid the entire connector using trifurcon terminals. Guessing a bad pin or trace. Anybody have a suggestion on what pin to mess with first or what else I should test. Appear to have continuity from pins to solder joints and no cracked pins or joints obvious. Reflow the solder on the pins for j115. Sounds like a cracked cold solder joint. 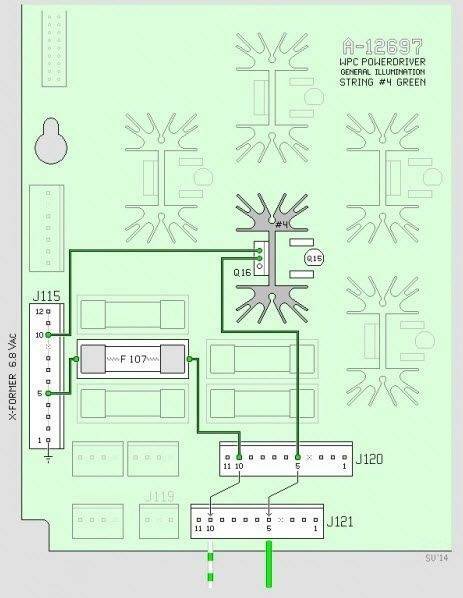 Is there an unused j connector immediately adjacent to j115 (j116 or j114)? It would be configured exactly the same as j115 with the missing pin in the exact same location. Some b/w games allow use of the adjacent connector. Your fix could be as simple as moving the plug over. Both of these answers are correct. But if you still have an issue those ICD connectors stink. You can try to reseat the wires in the plugs by pushing in with a small flat blade screw driver or replacing. See Molex and Trifucon pins. Thanks guys. See original post. I already redid connector using trifurcon. If you wiggle J115 and the lamps work, then it's likely a cracked solder joint on the board. LMK if you need help fixing it. See the "contact" link below. Edit: Should also mention this is a Rottendog board. Chris, thank you. I just reflowed all solder on the back of the board. Have a Hakko FX-888D. Did every joint on the back and flowed new solder as well. Continuity was good across all pins to back of board. Everything looked solid. I've attached a pic of my J115 connector which it looks like had the wires redone at some point. There are no "looped" wires as the manual states. I just replaced the connector with all trifurcon terminals. Also, I have to push the wires to the right (as shown in pic) to get the lower GI lights to come on. As soon as I relieve pressure they turn off. Should I replace all the pins in the connector on the board? Have a Hakko solder sucker but any help with how to do this would be appreciated. I'm assuming continuity could be established with the multimeter but the pin or solder joint still have an issue that would cause the lower GI to not light, correct? 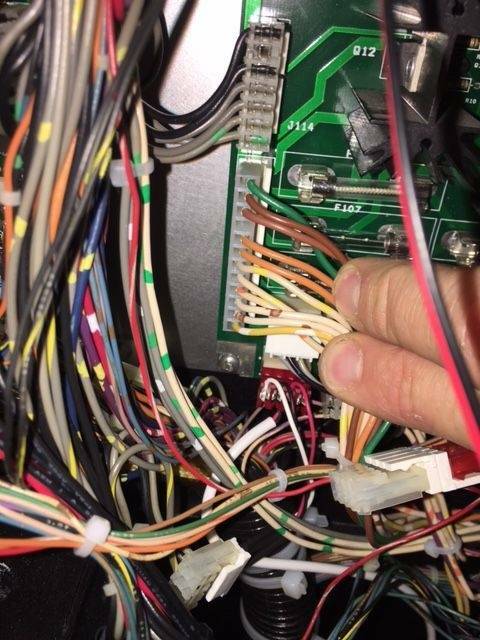 Looks like the issue is with the green wire. Just tried to redo the trifurcon connector but same issue. Is next step to replace the pin? Try and wiggle the wire itself and see if anything happens. I wonder if the wire is broken inside the insulation a bit further up from the trifurcon connector. Can you narrow it down to a certain wire by wiggling, as opposed to the whole connector? When you repinned the green wire was it frayed at all? Hey there. Thanks for the reply. Yes, I narrowed it to the green wire. The wire was not frayed and I've redid the trifurcon terminal twice. I will test this further but pretty sure it only comes back on when the wire is wiggled (aggressively) near the connector which in turn is moving the connector. The wiring on my J115 (Fish Tales) connector looks nothing like the charts and images here: http://www.pinwiki.com/wiki/index.php?title=Williams_WPC#General_Illumination_Problems. For example, look at my green wire compared to the one in the diagram. Whats up with this? Problem solved. Was the upper pin (green wire). Removed all solder and then reflowed solder while pushing pin to the right so that it made connection with the board I guess. A temporary solution I'm sure but back in business for now. thanks for all the help. BTW, you GI harness is the newer version, which doesn't "loop" through J115. Instead, that harness doubles the wire at the 9 pin molex connector between that harness and the transformer secondary. It's a much better solution.